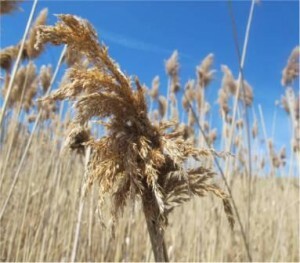 Phragmites is most commonly found in freshwater wetlands but it readily invades salt marshes that have been degraded by some type of flow restriction. In these cases, the most effective treatment is to restore the flow of salt water. Over a period of 10 to 20 years, phragmites will slowly die back and be replaced by salt marsh grasses. In brackish or freshwater wetlands where there is no possibility of introducing tidal salt waters, the following non-chemical control techniques can be used. Cutting or pulling has been used successfully to control phragmites. Treatments usually need to be repeated annually. The best time to cut phragmites is at the end of July. Cutting at other times may increase stand density. Phragmites stems should be cut below the lowest leaf, leaving a 6″ or shorter stump. Hand-held cutters and gas-powered hedge trimmers work well. Weed whackers with a circular blade were found to be particularly efficient but were more dangerous to volunteers (Marks et al., 1993). Cut or pulled material should be removed from the site and composted or allowed to decay on the upland. Some patches may be too large to cut by hand, but repeated cutting of the perimeter of a stand can prevent vegetative expansion. Cutting can be expensive and labor intensive. In Quincy, Mass., $150,000 was spent to cut 10 acres of phragmites three times one summer using Bobcats mounted with lawnmower clippers. Hand-pulling, though labor intensive, is an effective technique for controlling phragmites in small areas with sandy soils. After cutting a stand of phragmites, anchor a sheet of black plastic over the cut area using sand bags or rocks. High temperatures under the plastic will eventually kill off the plants. This technique works best when the treated area is in direct sunlight. The following year when the plastic is removed, a few phragmites shoots may return. These can be cut or hand-pulled. Prescribed burning, as a treatment by itself, can actually increase shoot densities and below ground biomass of phragmites. Burns can be effective, however, if followed by flooding in the marsh. Flooding a marsh after a burn requires the capacity to manipulate water levels. Burning has also been used successfully following herbicide applications. All applicable permits and licenses must be obtained prior to conducting a controlled burn. Phragmites fires can burn very hot and fast, and may start spot fires some distance away. This technique, therefore, can be dangerous, and is only appropriate for professional land managers. Glyphosate is most active in late summer when phragmites is in full bloom. Repeated treatments will likely be necessary. If the plants are too tall to spray, cut back in mid summer and apply glyphosate when regrowth reaches 2 to 3 ft tall. Choose Rodeo formulation for applications in standing water or along a shoreline (a permit from DEP is required for any pesticide application to a body of water). After 2 or 3 weeks following application of glyphosate, cut or mow down the stalks to stimulate the emergence and growth of other plants previously suppressed.